Americans with disabilities are less likely to vote, partly because of the cost or difficulty involved with traveling to a polling place to cast a ballot. Nationwide, an estimated 15.6 million people with disabilities voted in the November 2012 elections, with a number of them reporting having trouble reading or seeing their ballots or understanding how to vote or use voting equipment. A 2013 study funded by the U.S. Election Assistance Commission found that voter turnout for disabled adults was 5.7 percentage points lower than that of people who do not have a mental or physical disability. 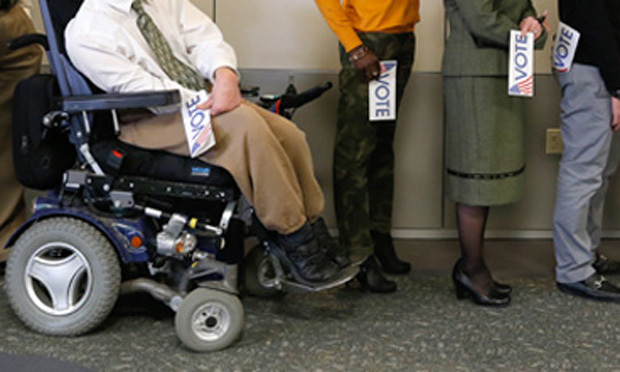 Under the federal Americans with Disabilities Act, state and local governments are required to ensure that disabled voters have an equal opportunity to participate in the voting process – from registering to vote to submitting ballots. Over the past several decades, government officials have implemented reforms designed to encourage disabled adults and other citizens to vote by making the process simpler and the experience easier. The federal Voting Rights Act of 1965, for example, prohibits state and local governments from requiring people to pass a literacy or writing test or to attain a certain level of education in order to vote. That law also allows a disabled voter to receive assistance from a person of his or her own choosing. The Voting Accessibility for the Elderly and Handicapped Act of 1984 requires U.S. polling locations to be physically accessible to physically disabled voters for federal elections, or to make available an alternate method for casting a ballot. The Help America Vote Act of 2002 requires that each polling place that is open during a federal election provide at least one voting system that is accessible to disabled voters. That measure focused specifically on assisting individuals with limited vision. In addition to enacting these broad laws, state governments also have begun offering “convenience voting” opportunities, or opportunities for voters to submit their ballots before Election Day or outside of polling locations. One popular form of convenience voting is early voting, which is offered in 37 states and the District of Columbia, according to the National Conference of State Legislators. During early voting, citizens can cast ballots in person during a designated time period prior to Election Day. Three states – Washington, Oregon and Colorado – automatically mail ballots to all eligible voters so they can vote by mail. In every state, voters can request absentee ballots, which can be returned by mail or in person. Several states, including California, New Jersey and Arizona, allow voters to join a permanent absentee voting list and, once joined, they will receive absentee ballots automatically for future elections. How have these changes affected turnout among disabled voters? A 2016 report published in American Politics Research looks at how convenience voting initiatives in particular have impacted turnout. For the study, Peter Miller of the University of Pennsylvania and Sierra Powell of the University of California, Irvine used data collected by the U.S. Census Bureau and the Bureau of Labor Statistics to examine whether and how disabled Americans voted in presidential and midterm elections between 1998 and 2012. Adults with a disability besides a hearing impairment are much more likely to abstain from voting. Having a labor-precluding disability raises the likelihood that someone will not vote by an average of about 78 percent. Americans with only a hearing impairment are nearly as likely to vote as Americans with no disability. Voters with a disability are significantly more likely to use mail ballots compared to voters with no disability and the likelihood has increased over time. There is no clear relationship between disability and early voting in person. Changes aimed at improving the accessibility of polling places for voters with disabilities will have little effect on turnout. Related research: A 2015 article published in the Election Law Journal, “Accessible Democracy: Reducing Voting Obstacles for People with Disabilities,” analyzes voter turnout and voting difficulties among U.S. citizens with disabilities. A 2012 study in Political Research Quarterly, “Making Voting Easier: Convenience Voting in the 2008 Presidential Election,” considers the partisan implications of convenience voting methods. Citation: Miller, Peter; Powell, Sierra. “Overcoming Voting Obstacles: The Use of Convenience Voting by Voters With Disabilities,” American Politics Research, 2016, Vol. 44. doi: 10.1177/1532673X15586618.